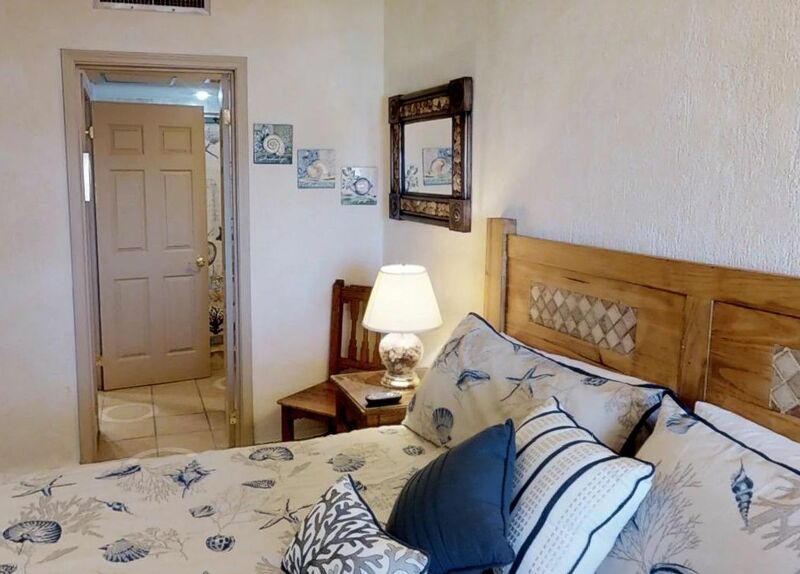 You are now looking for the best beach in Rocky Point, you are looking for comfort then you're in the right place. Princesa de Peñasco offers this and more. We have great amenities like a convenience store, fitness room, a restaurant with offers and happy hour, 3 swimming pools, volley ball court, BBQ areas, lots of parking, 24 hour security; we are a gated community with lots of green areas, all the fun you are looking for, right in front of the beach. This 1 bedroom and 1 bathroom condo is located on the 5th floor of the B Tower. This condo has an ocean view and accommodations for up to 2 guests. In the living area of this unit you have sponge painted walls with a tan pillow top leather sofa and a matching love seat. The room has an enormous cherry wood media unit furnished with a large flat screen TV, DVD, VCR and stereo. In addition the condo comes with high speed wireless internet and cable. You can surf the web or check your face book page for updates. You can get to the terrace through a set of sliding arcadia doors off the living area. In the dining area there is a mirrored wall with a lacquered oak wood table and four chairs. There is a beautiful light fixture hung from above to light the dining area. The kitchen has bright white cabinets with ceramic white tiled counter tops and black appliances. The cabinets and drawers are fully stocked with everything you need to feel as if you are cooking in your own home kitchen. There is a counter bar off the kitchen with four cloth covered stools if you are in the mood for more casual dining. The bedroom has a queen size bed with a maple wood head board and sea shell patterned bedding. The room also has a bay view window with a large double mirrored door closet next to it to hang your clothing. The room has a matching set of maple wood bed side tables and a console table furnished with a TV / DVD and a mirror mounted above it. In the corner of the room there is a maple wood chair that can be useful for putting your shoes on and off. The master bathroom can be accessed through the bedroom or the hallway. The bathroom has a large marble vanity with a single sink, tub, shower and commode. The terrace is furnished with a white oval table and four comfy cushioned chairs. Go down to Collin's for happy hour, then walk out to the front of the resort, enjoy the most majestic view of the sunset you could imagine. Make your trip worthwhile, stay at Princesa, you will not be sorry! We had an amazing time! Week I went with my husband and my 6 & 1 year old boys. there are three pools and the one in the center is heated.the beaches walking distance which I loved! they have a restaurant there with lots of options so we really didn't need to leave to eat.take some beach towels because the hotel does not provide any.